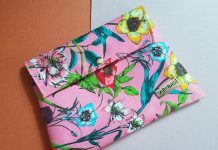 Hey everyone, today I’m sharing the review of my November Fab Bag which I received this afternoon. 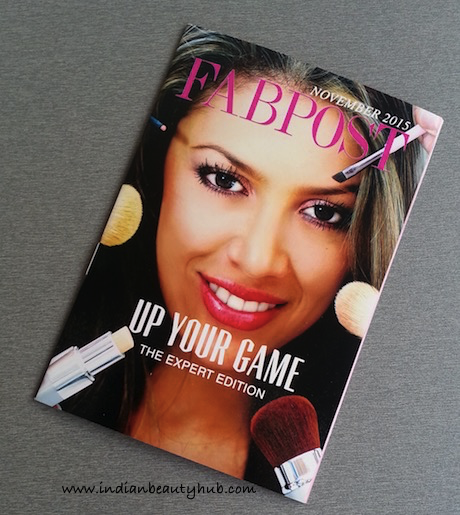 This month’s theme is “Up Your Game – The Expert Game” and they’ve introduced a new makeup brand Lollipops Paris. 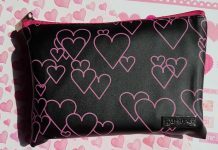 A black classic pouch contains 1 full-size makeup product, 2 samples of skincare products, 1 body care product and the monthly FabPost magazine. 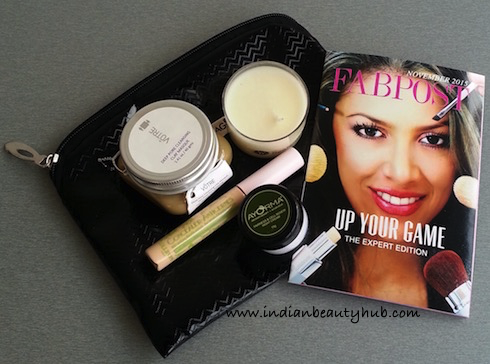 Votre Deep Pore Cleansing Clay Masque: This is my favorite product from November Fab Bag. I love Votre products as they work great for my oily skin. The bag contains a 40g sample of this clay masque which is good enough for 5-6 usages. The price of the Votre Deep Pore Cleansing Clay Masque is Rs.1080 for 100ml. Seasoul Dead Sea Minerals & Botanicals Massage Candle: I received a full-size massage candle which is enriched with 100% pure dead sea minerals and vitamins. It has very soothing fragrance which I really liked. I’ve not tried any such product in the past so I’m very excited to use this massage candle. 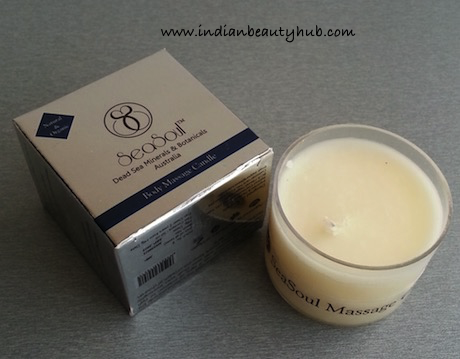 The price of the Seasoul Dead Sea Minerals & Botanicals Massage Candle is Rs.300 for 50ml. Lollipops Paris Matte Concealer: I got the shade Light Beige which is a close match to my skin tone. This liquid concealer claims to hide skin imperfections and gives a smooth, matte finish. I found the packaging somewhat faulty, as the applicator get stuck everytime I tried to put it back inside the bottle. 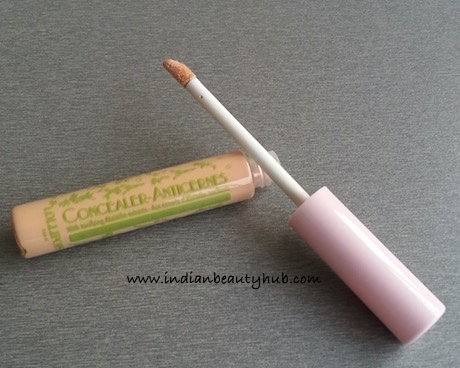 The price of the Lollipops Paris Matte Concealer is Rs.800 for 5.5ml. Ayorma Fairness & Cell Renew Night Cream: Lastly The bag contains 15g sample of this Parabens free night cream. It claims to fade dark spots and helps to diminish fine lines and wrinkles. 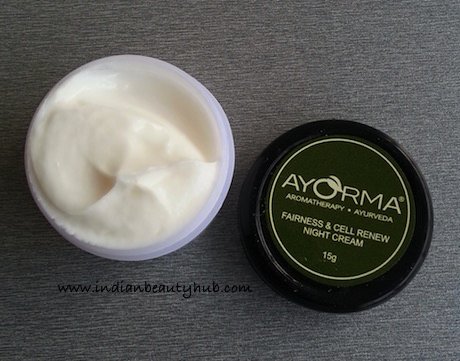 The price of the Ayorma Fairness & Cell Renew Night Cream is Rs.195 for 15g. 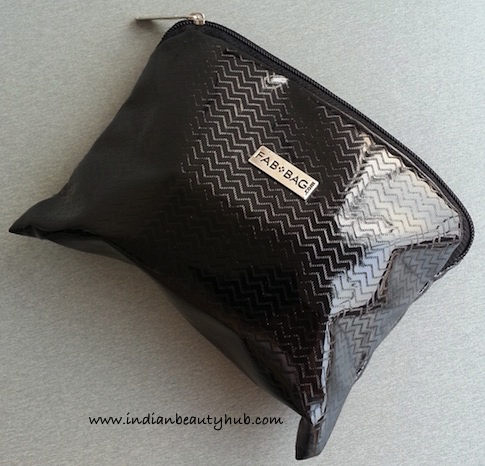 Overall November Fab Bag is pretty decent, but I was expecting something special for the Diwali month. I wish they had sent different product instead of concealer as they sent a concealer (Makeup Revolution) in the month of September too. 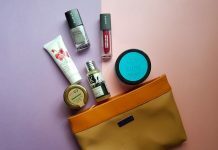 I was expecting a better bag this month given festive season…this month’s products are okayish..